African violets come in shades of white to deep purple with a variety of simple petals to elegant, ruffled ones. It doesn’t matter which variety of violet chosen the needs are the same. Be warned: Taking care of violets can become an obsession, but a good one as they give back much more than they ask for. An old Chinese proverb states, "Flowers leave some of their fragrance in the hand that bestows them." Violets calm the soul and bring hope to a troubled heart. Use these tips for healthy, happy African Violets! When you bring your plant home it will be in a small pot. 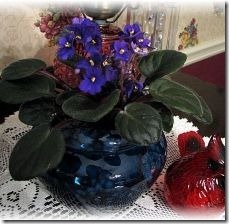 These violets like to be a bit root bound so go up one size when repotting. 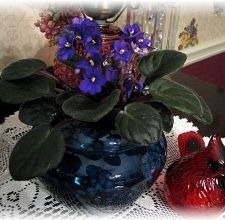 If you can, purchase a special violet planter pot. It will be ceramic and will have two pieces. The inset is porous and will absorb just the right amount of water. These violets do not like wet feet so this is great for that. You can also add liquid African Violet food to the water so it automatically feeds the plant as well. Stay clear of terra cotta pots as the clay will attract pests and will collect salts and other chemicals from the water that will harm the plant. Use water from a spring or bottled spring water. If this is not available use tap water [not softened water]that has set out overnight to allow the chlorine to evaporate. Water that has collected from a dehumidifier will work as well. If you must water from the top do not let the water flow onto the plant. Wipe off any droplets that may fall. These violets like a 40-50% humidity level. If moisture is needed you can place the pots in a pan filled with gravel and water. The water will evaporate and provide extra humidity for the plant. Violets NEED regular feeding to produce blossoms. I really like Miracle Grow’s liquid feeder made especially for African Violets. There are many brands on the market if it is not available. African Violets require 10-14 hours of light per day to bloom. They need a source of bright but not direct light. They do equally well with sun or artificial light as long as it isn’t direct. You will need to periodically remove the bottom leaves as they die off. With these tips the violet plant will produce blossoms for most of the year. Enjoy! If a leaf accidentally gets chopped off simply stick it in some soil and it will start a new plant!